In every workplace there are first-aid signs and a specified first-aider with access to a first-aid kit. If a minor injury takes place within the workspace, there is someone to take care of the situation using the correct equipment provided. But what are the responsibilities of an employer to provide first-aid equipment? Not every workplace will need a fully trained first-aider. A first-aid needs assessment is required, this will indicate to an employer the level of responsibility the appointed person has over the first-aid. The minimum requirement is for someone to look after the equipment and first-aid kit, and being responsible for the upkeep of a record and calling the emergency services when required. An appointed first-aider does not legally have to undertake first-aid training, though these are available for your company to take up should you consider it an important step to take for the safety of your workforce. There is no mandatory list of contents for first-aid boxes. So what you decide to include should be based on an assessment of your first-aid needs for your workplace. Many sterile items will have an expiry date attached to them, so always be aware of reviewing the contents of the first-aid box, ensuring all items are up to date and safe to use. Should you conduct a regular safety review of your first-aid procedures, you may wish to update your first-aid kit to reflect the changing nature of the workplace. It is highly recommended that you do not keep any tablets or medication in the workplace first-aid kit. Be it a restaurant kitchen, an office, factory floor or a company van, wherever your work find a first aid kit suitable for your needs. 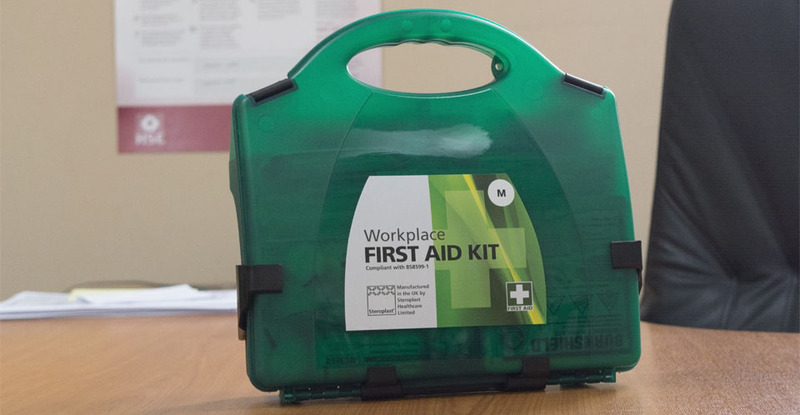 Every workplace needs a first-aid box and a first-aider trained in using that box. Whether a packed office full of people, or a smaller company, there is always the need for first-aid knowledge and understanding. 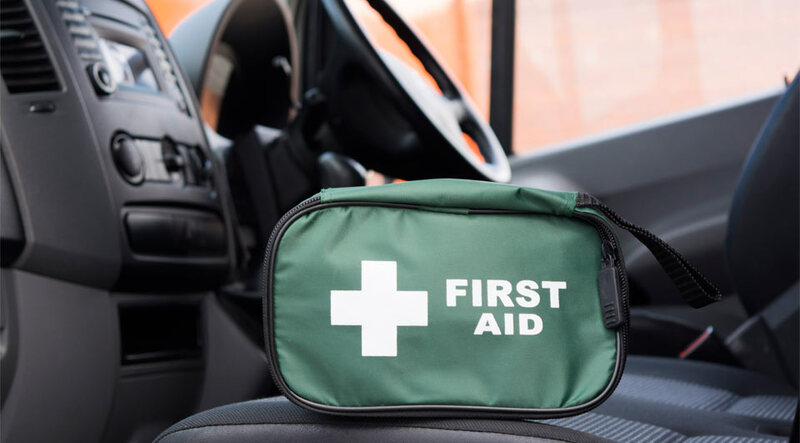 At Wray Bros we appreciate this and have a wide range of first-aid equipment, including boxes and signage, for larger organisation or lone workers or long range drivers. Take a look at our first aid range of products and if you have any questions please feel free to contact our friendly customer service team, who will be happy to advise and guide you. Call 0151 709 2271 or visit the Wray Bros website today. As important as all areas of a workplace are, the kitchen and food preparation area is the most vulnerable to contamination and possible illness. Maintaining high standards of cleanliness in these areas should be on top of your list. Following on from the last article, Office Kitchen Cleaning Schedule – A Simple Guide, we continue our look at office kitchen cleaning – including a more in-depth approach on how to tackle elements found within a typical workplace kitchen. Whilst, factors such as the size of the kitchen and how busy it gets throughout the day will help decide on the frequency of the cleaning, it should done routinely enough to control the level of dirt and micro-organisms to ensure it is a hygienic and safe place to eat. Prepare a solution of hot water and washing-up liquid in a kitchen sink to clean all the removable parts. It doesn’t matter whether you are preparing food at home, in the office or in a restaurant – a kitchen and dining area should be spotlessly clean. The list above may look a little daunting at first but we believe it provides a solid framework for anyone responsible for keeping the office kitchen and canteen areas clean. Cleaning within the workplace, can be hard work, though it doesn’t have to be difficult – Wray Bros can help you provide a hygienic workplace to help keep your colleagues and customers satisfied. For more advice contact Wray Bros on 0151 709 2271. The daily office grind. We’ve all been there and it’s the break times and lunch hours that can punctuate the hard working day with some respite. Unfortunately, there are many office kitchens and canteens that are just not up to scratch cleanliness wise. Industrial cleaning supplies shouldn’t just be the preserve of 5 star restaurants – everyone deserves to be able to prepare and eat food in a clean and hygienic environment – even in an office. As people bring in dirt from outside the building, the office areas and the bathrooms it is vitally important that worktop surfaces, tables, microwaves, toasters, kettles, and most of all the fridges, are kept as clean as possible. Without a clean environment your workers are at risk of bacteria that could cause such illnesses as gastroenteritis and the like. Whether you and your colleagues clean the office kitchen yourself or you employ a cleaning company. We’ve put together a suggested guide on how you can keep different areas of your office kitchen clean on a regular basis. An odourless, multi-purpose cleaner sanitiser and disinfectant spray that removes dirt and kills bacteria. How to use: On food contact surfaces wipe or spray the surface and rinse with clean water. On non-food contact areas simply wipe or spray surface then allow to air dry. Jangro Kitchen Degreaser Heavy Duty is a powerful multi-purpose kitchen cleaner and degreaser with bactericidal properties. Suitable for use on all hard surfaces, i.e. floors and tiles. How to use: For cleaning everyday dilute 20ml of detergent per 5 litres of hot water. Mop, wipe or spray the surface then rinse with clean water. For heavily soiled areas and grease dilute 100ml of detergent per 5 litres of hot water. Mop, wipe or spray surface then rinse with clean water. How to use: Spray sparingly directly onto surface and wipe clean immediately with a clean, dry cloth. Jangro Concentrated Lemon Detergent is made from high quality ingredients which are effective and mild to the skin. Ideal for manual dishwashing and as a general hard surface cleaner. How to use: For washing up dilute 10ml per 5 litres of hot water. For floors, walls and tiles dilute 10ml per 5 litres of warm water. Don’t forget an another important element is the daily task of managing the kitchen office waste. It is suggested that general waste is black bagged. Waste bin liners should be replaced as required. Finally, for the recycling of paper, cans, cups etc. follow your company guidelines on recycling waste. Look out for our previous cleaning guide articles: Washroom Cleaning Schedule and General Housekeeping Cleaning Schedule. Contact Wray Bros for further help and information on how to get the best from your janitorial supplies. Toecap: Safety footwear doesn’t necessarily start and end with the toecap but it is a good place to begin a review of the different footwear features. Toecap footwear can be split into two main groups – metal and non-metallic, i.e. composite, regardless of material both versions are designed to meet EN standards. The composite materials tend to be plastic which makes the boots or shoes lighter and being non-metallic they do not retail the cold. Tread: Slip resistant footwear protects workers from workplace slips which can lead to bruising, sprains and possible back problems. The nature of slips can differ depending upon the environment and the cause of the slip, e.g. grease on the floor, over polished floors and spills etc. Consider the Tread: When looking at slip resistant footwear consider the tread pattern, especially if to be used, on wet surfaces. The sole should offer maximum contact to the floor surface and allow the user a feel for the conditions underfoot. External Warnings: A well run business will have procedure in place to warn and minimise the risk of slips and trips with wet-floor-signs, floor cleaning products and entrance matting etc as well as slip resistant shoes. Purchasing safety footwear for the workplace can become a cumbersome task if you let it become one. There are quite a few elements to consider, from the task the user will need them for, how comfortable should they be, satisfying a number of different specialists in the workplace and obviously ensuring that above all else they are completely safe to use. It’s no good buying basic footwear if your workers will be in extreme conditions with extra risks. We hope this and the previous article has helped you if you are looking to purchase Steelite Safety Boots for your workplace. If you have a specific requirement and you’re still not 100% sure on what you should be buying, give our friendly customer service team a call Wray Bros today on 0151 709 2271. They are always happy to help and will be able to fully advise you on which direction your next steps should take. Walking in the wet, climbing irregular surfaces, handling heavy machinery, falling objects, and slippery floor surfaces, exposure to electricity or even sharp objects on the floor are just a flavour of some of the hazards our feet have to contend with depending upon your workplace and daily responsibilities. Step 1 – Choose a Good Supplier: When you go to a supplier to purchase footwear for work purposes they should be able to help you. A reputable supplier will review suitable footwear to narrow down the options based upon your job requirements. The supplier should provide guidance on what safety footwear suits different work environments. So if you’re in engineering you’ll have vastly different requirements to someone working in food or manufacturing. Step 2 – Assess the Tasks at Hand (or feet): Ultimately, a risk assessment of the workplace and the job in-hand is where the process should begin. By understanding the level of protection required and the potential hazards the job role entails will help select the right safety footwear. The type of material used underfoot can make a difference, for instance footwear with shock absorbing qualities are ideal for workers who are on their feet for much of the day. Other soles can protect from heat, puncture and cuts. Step 3 – Satisfy all Relevant Staff: Within a typical organisation the selection of safety footwear will collectively involve different people that each needs to be satisfied. For instance, the Health & Safety Officer will want to review the suitability of the footwear, the purchaser will ask about price and availability and obviously the user will want to make sure the footwear is comfortable and fits correctly. Step 4 – Comfort is Important: It is important to note that new safety footwear should not be uncomfortable, neither should you adopt the thinking they get more comfortable once they get ‘worn-in’. A comfortable person will automatically perform their job with greater ease, flexibility and happiness. So pick your work boots based on safety first but with a nod to comfort and the long term benefits that brings with it. Another aspect often overlooked and that is breathability. Many users often look for waterproof footwear but always appreciate the fact feet produce a lot of moisture of their own accord. Footwear that offers good breathability helps with foot hygiene, comfort and stops feet getting wet. Look out for part 2 of the ‘Taking the Right Steps to Selecting Safety Footwear for Work’ article. In the meantime for more information on how to find suitable industrial safety shoes for you and your colleagues please feel free to contact Wray Bros. Our customer service team will be more than happy to offer advice and guidance, either over the phone on 0151 709 2271 or face-to-face at our Merseyside Trade Counter.